BRUSSELS: Mehdi Nemmouche stands accused of carrying out Europe’s first attack by an Islamist fighter returning from the war in Syria. But his journey from a French foster home to a Brussels court began not in a Middle Eastern desert but in a run-down industrial town. This week, he will go on trial for four anti-Semitic murders during a shooting spree at Belgium’s Jewish Museum. Separately, he is also accused of acting as the jailer of four French journalists taken hostage by jihadists in Aleppo in 2013. The trial will last several weeks, but the 33-year-old is already a case study in the radicalization of some young European Muslims. Belgium and France, in particular, fear the defeat of groups like the Islamic State in Syria will send more angry young men homewards. But Nemmouche seems to have been on a radical path long before he set off, in early 2013, for the so-called “caliphate” on the Euphrates. The investigation into the May 2014 massacre in the museum has pieced together elements of his background. His foster parents, in documents seen by AFP, describe him as an “angry” youth, “capable of the worst as well as the most kindly” acts. He committed his first known crime at 13, then at 16, he spent three weeks in a juvenile prison for a hold-up with an air pistol after being convicted by a children’s court. His criminal record grew ever longer in his late teens, with traffic offences and muggings, and his grandmother lost track of him after his second jail term. In 2007, aged 22, he headed to Provence in southern France after gaining a vocational qualification as an electrician, but soon fell back into trouble. 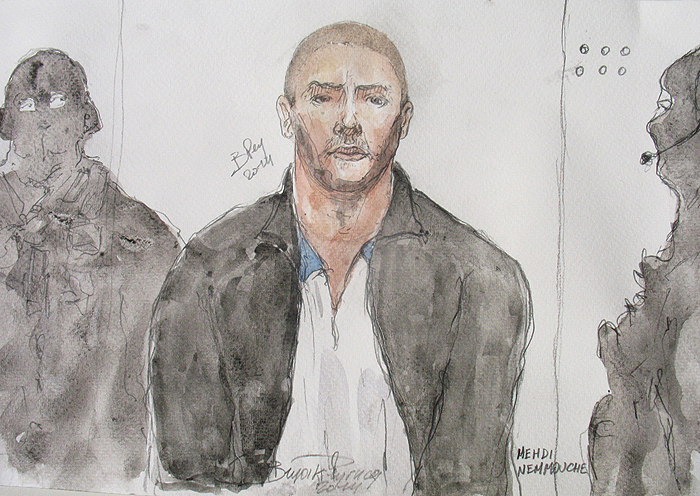 “What an enormous waste,” his former lawyer Soulifa Badaoui said after the museum murders, lamenting the fact that the authorities had not helped Nemmouche integrate. “No one knew what to do with an intelligent, lively young man who wanted to get out, become an ordinary French citizen,” she told AFP. Between December 2007 and December 2012, he spent five years in custody — and investigators believe this is when his ideas hardened. In prison, he was known as an “extremist proselytiser” who tried to organize group prayer and spoke of jihad and the 1995 “genocide of Muslims in Bosnia”. This linked him to the “Roubaix gang” — French Islamists who returned from the Bosnian war and carried out robberies to fund Al-Qaeda, some of whom he knew. When his grandmother saw him in Tourcoing in December 2012, he had a long beard and was praying daily, something she had not seen before. Less is known about his experiences in Syria, but three former French hostages have identified him as their “strict and violent” overseer. They say he did not hide his admiration for Mohammed Merah, who murdered three French soldiers, a Jewish teacher and three young children in 2012.